Last fall, I was invited by my state representative, the venerable John Dougall, to attend a lecture in Alpine about the Constitution. The speaker: Mike Lee. I had never heard of Mike, but I was free that evening and looked forward to both the lecture and an opportunity to network with some of my friends and allies, so I went. I was quite impressed with the lecture, and later found out that there were rumors that Mike was considering a run for the U.S. Senate seat held by Bob Bennett—an individual who I have referred to as being no friend of the Constitution. After asking a few questions, surveying the political landscape, and pondering the matter, I sent Mike an email saying that if the rumors ever proved true, he would have my initial support and my volunteered services. Six months later, here we are. Having served as Mike’s Director of Social Media, I’m happy to have played a small part in the large and complex effort that is involved in running a state-wide race for a federal office. Back in December, I entered this campaign with two key goals, both of which have now been fulfilled: defeat Bob Bennett, and ensure the best Republican secures the nomination. To me, Mike Lee was the clear leader of the pack, and the person who best understands and will adhere to the Constitution. Other candidates had their positive attributes, but Mike was the obvious choice for me in determining who to support to achieve my second objective. I’ve learned many interesting things while on this campaign, chief among them that I am a lightning rod (okay, I pretty much already knew that), and that my outspoken, transparent nature, coupled with some seemingly controversial opinions, is a recipe for attracting attention—not only to myself, but also to the candidate whose staff I was on. I’ve incurred the wrath and/or targeted opposition of a (now former) radio host, the incumbent Senator himself (on many occasions, and through TV ads, radio spots, blog posts, emails, and direct mail), powerful pro-Israeli lobbying organizations, and a high-ranking state official who shall be simply referred to as “John Doe”. I take all that in stride, and with a slight sense of satisfaction—after all, as Ezra Taft Benson said, “Those who fight for principle can be proud of the friends they’ve gained and the enemies they’ve earned.” My perspective on these attacks and protests is that these individuals have weak character, and in some cases are intellectually deficient. Their cheap shots and manipulation or misinterpretation of my words for political gain is disappointing, but unsurprising. But that’s all in the past, and while each of those experiences makes for a great story (Hey, did you hear about the time Bob Bennett’s son Jim, standing in for his father, attacked Mike in a debate by saying that one of his supporters wasn’t a fan of Abraham Lincoln? ), the goal has been accomplished. 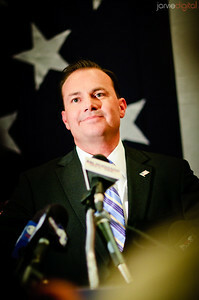 Mike Lee has secured the Republican nomination. What now? I’m no longer on Mike’s staff, and the responsibilities that were mine for half a year have been transitioned to others who are equally capable. Sam Granato stands no chance, though I do look forward to the debates, mostly because I hope to see Scott Bradley (Constitution Party) included. His presence will improve the dialogue and will prevent the debates from degrading into Republican/Democrat talking point banter. I’ve told several people in recent weeks that I have been considering voting for Bradley in the general election, even if Mike won the GOP nomination. While Mike and I agree on many things, we do disagree on several issues. If Scott Bradley is more closely aligned to the positions I adhere to, then I quite likely will vote for him. I’ve been so involved in Mike’s campaign, though, that I have yet to do my due diligence with Scott on some of the issues I’m concerned about. I have emailed him a list of questions, and based on his responses, I’ll firm up my decision on whether to vote for Mike or Scott come November. Should I lean towards Scott, though, it should not be construed as a vote against Mike. Between he and Scott, my vote will be what I perceive to be the greater of two goods, rather than the standard “lesser of two evils” to which most Americans have become accustomed. Living where I do, I realize that as the Republican candidate, Mike is sure to win the general election, and become Utah’s junior Senator. As such, I have the comfort of considering a third party candidate while remaining confident that the half of a year I’ve spent tirelessly working to get Mike the Republican nomination will not be for nothing. If and when Mike becomes Senator Lee, and though I disagree with him on some issues I find important, I will be happy knowing that an establishment incumbent with a substandard voting record has been replaced with an individual who understands and has committed to adhering to the Constitution—a document which every congressman takes and oath to support and defend, but far too few actually do. In the past few weeks, I increasingly doubted Mike’s chances of winning, though I continued to support him and contribute whatever I could. The Energy Solutions and KNRS conspiracy theories concocted by Cherilyn Eagar and Bob Lonsberry in the past couple of weeks, and embraced by Tim Bridgewater’s campaign, surely damaged Tim’s chances. Endorsements and “get out the vote” assistance from like-minded organizations helped mobilize voters supportive of Mike’s platform. In the end, and despite various polls showing one candidate up over another (and vice versa), the abysmal few voters who showed up to participate in the primary election have spoken on behalf of themselves and their peers, and have determined that Mike Lee will, barring some calamitous controversy, become our next U.S. Senator. Senator Mike Lee from Utah: change I can believe in. Good win for Mike. Intersting prespective on voting for Mike. I support you in saying that there are some things I disgree with Mike, but he is better than what could have been. I joined, in helping the campaign, for one main reason…I am against nation building..I hope Mike follows through with his commitment to follow that line of thinking he originally supported. I recently joined the facebook group (something like) “If Mike Lee Loses, I Will Support Scott Bradley”. You bring up a good point, though. Even with Mike still in the race, it behooves us to compare him to Scott Bradley and Sam Granato and vote for the best candidate. I enjoy reading your blog very much and I would like to congratulate you on Mike Lee’s win. Nevertheless, you paint Lee and the Lee campaign as a little too angelic. I had no dog in this fight, and so please don’t assume I am a Bridegwater voter. Lies have been flying around on both sides, and you seem to conveniently forget some of the downright BS Lee/Lee campaign leveled at the other candidates. I understand you worked on the campaign and appreciate Mike Lee for who he is and what he can do for Utah… but I still think your post smacks of hero-worship and fails to recognize that Mike Lee is a politician, not a savior. Finally, I wish Mike Lee the best in his road to the Senate. I have heard many Lee supporters talk about “change” and “transformation.” How is it that a junior senator with a giant target on his back (he has ruffled the feathers of the GOP establishment), will keep his campaign promises and still “fight” the Obama agenda? His pledge against earmarks will certainly test his character (a test most newly elected senators eventually fail), and we shall see how much “change” he can work when he is despised by the GOP leadership in both the Senate and the House for defeating a senator like Bob Bennett. Again, I hope Lee is that man he says he is… but I have my doubts. It’s nice to hear someone else articulate the lack of certainty I have felt for weeks. Going in to yesterday i had no doubt about who I thought the best candidate was and no confidence that the people of Utah would agree with me. Thankfully they did and I won’t have to endure a “lesser of two evils” mentality for the senate race in November. Lies have been flying around on both sides, and you seem to conveniently forget some of the downright BS Lee/Lee campaign leveled at the other candidates. I have been witness to no lies coming from Mike’s campaign. On the contrary, I have had firsthand knowledge of several lies being leveled towards Mike and his campaign, and I worked to counter each of these absurdities as they came up. Some may feel that Mike’s references to Tim’s business dealings were a misrepresentation of reality, but from data I’ve gathered, that’s not the case. Tim was never too open about specifics in his business dealings, though, so if there has been a lack of clarity in the public debate about those issues, I think the problem was enabled by his own vague descriptions of his businesses and financial interests. …but I still think your post smacks of hero-worship and fails to recognize that Mike Lee is a politician, not a savior. Perhaps you glossed over the part where I said there’s a strong possibility I might not even be voting for him in November? If this was hero worship, I wouldn’t even fathom that idea. I think Mike is better than most other candidates and current politicians by leaps and bounds. This does not mean he’s perfect by any means; again, he and I disagree on several fundamental issues I feel strongly about. I don’t treat, recognize, or otherwise consider him as a “savior” of any sort. I do, however, think that he will be a strong proponent of constitutionally-limited government, and in that effort I support him. Where he deviates from that, I’ll first try to persuade him, and if necessary, oppose him. I’ve told him as much. I ran the numbers this morning and while turnout is low, I’d say it is still representative of the state in general. I think turnout will be over 15% when the final precincts and absentee’s come in. Some democrats didn’t even have a ballot, so we can tack on a few points for Democrats, Constitutionalists and other parties without primaries. I certainly looked at Utah’s party make up and decided I had a greater voice participating with the Republicans rather than remaining unaffiliated. The Census estimates there are 2.78 million people living in Utah. Looking at some of the underlying numbers, I’d say a reserved guess of non-citizens (which the census refuses to report), make up 6% of that. A whopping 31% of Utahns are underage, leaving 1.8m Utahns who are eligible to vote. Of the approximately 1.8m potential voters, 1,512,433 are registered, though I assume three are a few thousand deceased and duplicates in there. Which means about 83% of eligible Utahns are registered voters. The national races gathered 212,758 votes, with 17 precincts, provisional ballots and absentee ballots outstanding. That’s 14% of registered voters and ~12% of eligible Utahns. It’s not the 24% that we saw a couple of years ago for president, but this was a lower publicity campaign. Over the last 40 years, Utah primary elections have ranged between 15-30% turnout. Even when the the overall democratic party didn’t embrace immorality and actually had a chance back in the 70’s, state primaries were still under 30%. Oh, and a bunch of establishment types are going to go after you for not being a true Republican. Those herd guys are so caught up in their ideology that they forget about voting for the best candidate, compromise and good governance. And those party hardliners are the precise reason why primary and general election turnouts are so low. It’s nice to finally have a candidate who doesn’t push business as usual. Connor, congrats! I wasn’t able to get involved in the primary process this year but I feel that Mike is a candidate I can feel comfortable with. I would probably have far less in common with Mike’s platform than yourself, though in terms of character and ability/willingness to reason he was unmatched among his peers in the running. Will you be listing your differences and/or the questions you sent to Bradley? I am pleased to see that Mike Lee won, and will most certainly vote for him in November. It has nothing to do with party affiliation. I probably don’t share all the same concerns you have, but am curious to see what differences you see. I like Mike. I was happy to see him win. I put up signs, talked with people in the neighborhood, supported him in online forums like Facebook, and generally did what I could to help him secure the nomination. I agree that what we did last night, basically, was elect Mike Lee to the U.S. Senate. I have to admit that part of the reason for my adamant Lee support was seeing that Lee had a thoughtful, informed, and nuanced view on our foreign policy. The attack ads about “thugs in Utah county”, “marines joining the peace corps”, and “meals on wheels” impressed me in a *positive* way. Here is a guy, I thought, who understands that sending military brute force with guns in one hand and ‘orphanage materials’ in another is bad for them and bad for us. He may parrot the party line, but he chooses his words rather carefully — in such a way that he seems open to honest consideration of the facts. I’m generally opposed to ‘nation building’, but I’m reasonable. I believe if you are going to participate in any attempts at it, you don’t forcibly occupy the country, accidentally kill civilians every day in your brutish imprecise attempts at helping, and then expect your brave men and women in uniform *not* to have giant targets painted on their back. Anyways, foreign policy is what I am watching the closest in this election. I have a lot of principles that are important to me. Mike Lee is enthusiastic, clearly competent, and engaged on many of them. But I honestly don’t see how you can balance the budget, reduce corruption, or strengthen our national character without openly standing up to our absolutely insane foreign policies. To me it is the ‘elephant in the room’ when Federal governance is discussed in Utah. If Mike Lee can be a leader that finally helps explain these things in a way that a majority of Utahns can grasp, then he will continue to have my support. If he continues to back away from that challenge — *and* somebody else (Bradley?, Granato? Anybody?) does a better job — then I may have to shift my support. Great Thoughts Connor. I too assisted Lee at the Convention and in the Primary. I will however be voting for Bradley in November. I have spent too much of my life voting for the guy I thought had the best chance to win even if he wasn’t who I thought was the best candidate. I know many think this is “throwing away” my vote, but I have come to the realization that if I compromise my standards on election day, how is that any different than a politician using the same logic when it comes to his decisions on key votes. I think Lee is about as good a “party guy” as you’re going to get. But from my intimate interactions with him during my time as a delegate, it was obvious he does not have complete freedom of conscience to even truly consider what is right because he is beholden to the party/electorate which is corrupt/misinformed on many issues. Bradley isn’t perfect either, but at least I know he has less a chance of being controlled by those in control of our 2 party 1 choice system as it currently stands. I agree on the foreign policy thing. You fix the worst things first – so if we can stop massacring thousands upon thousands of civilians every time our ego is in danger, then we can worry about stem cells or education. For example, Obama has made only small steps in the right direction for foreign policy, and most of those in my mind only seem to be an end to this garbage “war on terror/Uh-merica” rhetoric, which feels nice but in and of itself isn’t a solution. As to the previous comment, It’s not accurate to say that Mike Lee is the “party guy” when he was just nominated to represent his party despite a multi-million dollar campaign by the mainstream Republican establishment and the local media to keep him from getting the nomination. At some point, you have to give the people some credit for using the existing system to choose their own nominee rather than allowing traditional kingmakers to continue to call the shots. The PEOPLE did it in 2008, the PEOPLE just did it again in 2010. As mentioned above, I am also interested in what concerns you have with Lee. I myself am not feeling comfy with his foreign policy views. Would you be willing to share? Assuming that blog to be yours, John, (and even if it isn’t), Scott Bradley does not (to my knowledge) support a balanced budget amendment (since it might lead to a ConCon), and Mike’s proposal would have an exception for when we are in a declared war. All this talk of balanced budgets and more amendments which have proven only to make our situation worse is futile. Congress is ceremonial, 94 percent of the bills past aren’t even read. We have had a corporate take over of America through a fiat monetary system outside of the control of Congress or the people . We will have perpetual wars and an ever lowering standard of living under our current central bank ownership. If a senator can’t see that our monetary system made out of nothing which is corrupt and is a total fraud on America then I say we don’t help them get to Washington. Understanding a constitutional monetary system is crucial. Government debt and federal taxes with a fiat currency is an oxymoron. Connor, I am very familiar with both yours and Scott Bradley;s position on principles and i believe the 2 of you are very much in agreement, much more than you would be with Mike Lee. I supported Mike Lee for the primary but will vote for Scott bradley this fall. He is the real deal. I am not so sure about Lee though.